The proper magikal use and application of the Unicursal Hexagram has been discussed and speculated on by a number of authors beginning with its wider introduction by Aleister Crowley into his version of the Golden Dawn system. It can be found in very rudimentary form in papers assigned to 4=7 in the Golden Dawn system and probably has its origins in the mathesis of Giordano Bruno. Various ways of applying it have been put forward but there has been minimal analysis of the principles underlying its attribution and application. If the standard premises upon which the Golden Dawn formulates its planetary hexagrams are applied, a symbolically consistent system of invoking and banishing can be derived. Further these formulations can be verified by corollary application of the elemental paradigm, with similarly consistent and symbolically harmonious results. The attribution of the points of the hexagram to the planets is essentially a projection of the planetary values assigned to the Sephiroth onto the external angles and center of the hexagram. This is true for the traditional Magen David form used for the Earth Hexagram in the Lesser Hexagram Ritual, to that, of the other elemental forms derived from it and for the Unicursal Hexagram. The Golden Dawn system, based on principles laid down in the Sepher Yetzirah do this according to a Ptolemaic model. Simply stated when one observes the motions of the classical planets, over time, they traverse space relative to the background sky at various speeds. The Moon is the fastest taking approximately one month to transit the entire ecliptic, Mercury has the next highest apparent velocity, followed by Venus, the Sun, Mars, Jupiter and Saturn, in that order. It is upon this basis that planets are attributed to the Sephiroth. So beginning above Earth as Malkuth, the Sephiroth are attributed to the planets in order of increasing apparent velocity up to Binah. The Sephiroth are conceptualized as celestial spheres in their Macrocosmic form. It should be remembered that the Otz Chaim or Tree of Life of the Qabalists has two foundations in reality upon which it is predicated: the human body and the heavens, all other attributions are essentially synthetic. Various renderings of the Sepher Yetzirah give this in different ways (cf. Kaplan for the range and theory), but to be true to underlying Eudoxian principles and harmonious with both the Government of Hours and the dependent system of days of the week this order must be adopted here. For a fairly comprehensive discussion of the empirical underpinnings of this order see “The Ancient Secret of Sevens” et passim in John Marineau’s A Little Book of Coincidences. In the Copernican system these values still largely hold from our terrestrial perspective below Yesod. That is from the point of view of the magician, the Sun is the center, as it is in the Unicursal hexagram. Mercury and Venus may be closer than the Sun, Mars and Jupiter are always farther and Saturn is always the farthest. 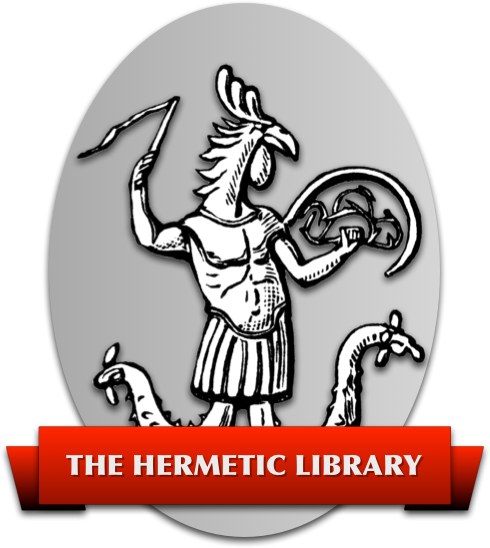 Scientific magicians are advised to closely observe the astronomical facts of their working, because some variance between Mercurial and Venusian, and Mercurial and Solar forces does occur and seems to be responsible for both the varying assignments of Raphael and Michael, and the seeming contradiction of values assigned to Mercury: Thoth as god of truth and Hermes as the patron of liars and thieves for instance. The angles (and center) of the hexagram, in both the traditional and unicursal forms, so attributed, are used to evoke or banish planetary forces by means of formulating (drawing the lineal hexagram from a given point in a given way). Note first that the formulation of the lineal figures appropriate to invoking and banishing for the elemental Pentagrams differs from that used for the Planetary Hexagrams. The formula for the pure elements applied to the Pentagram is toward the element without initially crossing the interior legs of the pentagram (cf Liber O). This principle will become important when understanding how the Unicursal Hexagram is attributed to the elements. The problem does arise that there are two lineal forms that fulfill the conditions for either invoking or banishing Sol. This may be resolved by the ingenium of the magician regarding the precise nature of the Solar force being invoked, for example Michael is intrinsically more martial as the leader of the Host of Heaven, whereas Raphael is essentially more mercurial as the Healing of God. Elemental attributions in the Pentagram are derived from the quadrature of the Reformed Great Table and the Order of Elements in Enochian. The demonstrations, proofs and derivations of this are too complex to go into in this place, but the basic order is Air, Water, Earth and Fire and they are assigned to quadrants in the arrangement Upper Left, Upper Right, Lower Left and Lower Right respectively (they are not fixed within the Enochian system but this convention underlies most modern terrestrial elemental assignments: (Golden Dawn, Wicca, BOTA etc). Compare this to the attribution of the elements to the Pentagram (ignoring the topmost point, or bottommost in the case of the inverse pentagram); they are identical. Likewise if the top and bottom points of the Unicursal hexagram are ignored for the purpose of assigning the pure elements, the quadrants can similarly be attributed and the resulting formulations will be justified symbolically on the basis of the sephirotic and planetary attributions. By the rules previously explicated, each of these points will have a natural invoking and a natural banishing form. For Air the invoking from would be Upper Left to the Bottommost point, from the Bottommost to the Upper Right, from the Upper Right through the Center to the Lower Left, from the Lower Left to the Topmost, from Topmost to the Lower Right, from Lower Right through the Center back to the Upper Left. What is interesting about these 4 formulations is that in each case the invoking motion from the elemental quadrant is toward a sephirotic identity with that element. Note 777 column XI, which gives the elemental attributions of the Sephiroth, an attribution based on the application of the Golden Dawn’s יהוה‎ formula, ascending the Tree and discarding Earth after Malkuth. Invoking Air proceeds from the Upper Left (the Air Quadrant) to the Bottommost point, which is attributed to Luna and Yesod. Yesod is attributed to Air. Invoking Water proceeds from the Upper Right (the Water Quadrant) to the Lower Left point, which is attributed to Mercury and Hod. Hod is attributed to Water. Invoking Earth proceeds from Lower Left (the Earth Quadrant) to the Topmost point, which is attributed to Saturn. Saturn equals ת‎ (Tau: 777 row 32 & 32 bis) which equals Earth. There is no point point in the hexagram that goes to the Sephiroth attributed to Earth, that of Malkuth. Finally invoking Fire proceeds from the Lower Right (the Fire Quadrant) to Upper Left, the Upper Left is attributed to Mars and Geburah. Geburah is attributed to Fire. Note the elegance with which the invoking formula of the elemental pentagram (motion toward an element) is wedded to the invoking hexagram formula (clockwise motion from). Thus is the terrestrial wedded to the celestial, and the microcosm brought into harmonious union with the macrocosm. Euclid. The Thirteen Books of the Elements (3 vols). New York: Dover, 1956. Kaplan, Aryeh. Sefer Yetzirah: The Book of Creation. New York: Weiser, 1997. Lundy, Miranda. Sacred Geometry. New York: Walker & Co., 1998. Martineau, John. A Little Book of Coincidence. New York: Walker & Co., 2001. Regardie, Israel. Golden Dawn. Woodbury, MN: Llewellyn, 2002. Regardie, Israel. The Complete Golden Dawn System of Magic. Tempe, AZ: New Falcon, 2003. Yates, Francis. Giordano Bruno and the Hermetic Tradition. Chicago: Univ. of Chicago, 1964.